I dare you, push the Start Here button. What happens? What should happen? What do you want to happen? That’s the first step. What do you want to happen? It colors everything else that does happen. Is your objective OSHA compliance or do you want a Safely Working Environment? In the last post I said that there was no Start Here button at OSHA.gov. But, they do provide some guidance. In the OSHA recommended “Safety and Health Program Management Guidelines” the first element in a program is “Management Commitment and Employee Involvement.” There’s no question that getting everyone on the same page is the most important objective. If you are game, review the Guidelines here. So, the first step might be to prepare a statement committing to empowering employees and supervisors to build a Safely Working Environment. Feel better now? However, it’s not needed at the moment as we want to keep the guidance simple, sensible and easy to implement. So, before you do that, adopt Safe 6. Make it your workplace mantra. Put it at the top of the list of workplace rules and requirements. Make it the one rule to rule them all for your Safely Working Environment. We’ve already discussed how Safe 6 fits into the workplace. If you missed that discussion, you can be access the series of posts on the Safe 6 Pack page. Once we make Safe 6 the rule, we can build the Safely Working Environment around it. 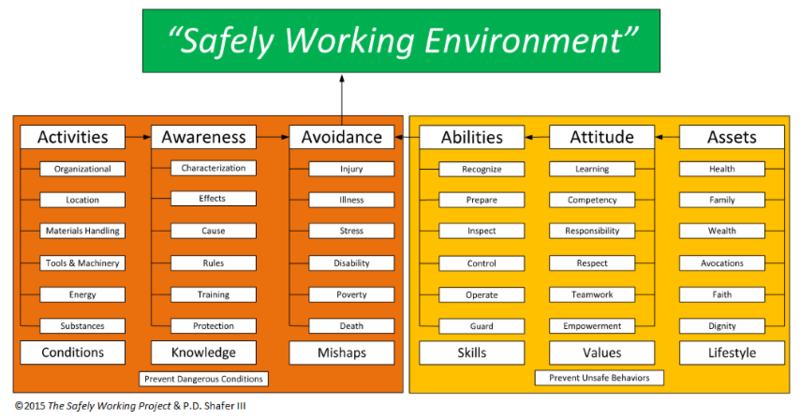 So, familiarize yourself all 6 aspects that shape the Safely Working Environment. We posted an overview a while back. Check it out here. A Safely Working Environment will prevent dangerous conditions and unsafe behaviors. Safe 6 is a its core. Coming soon: Safe 6 Approved MOTELS, Believe It or Not!?! “Safe 6” and “Safely Working” are registered trademarks of Trailmarker Ltd. The Safely Working Project is focused wholly on employees and their health and well-being in the workplace. The Project promotes useful guidance that does not depend on a safety professional or staff to facilitate in the workplace.